Commissioning requires one device with the Commissioner role, and one device with the Joiner role. 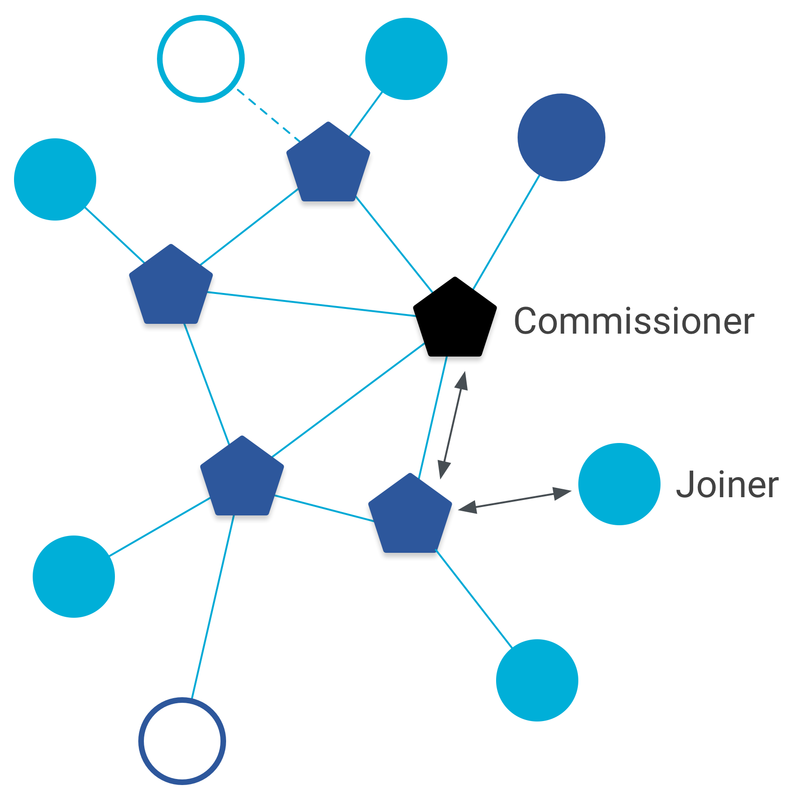 The Commissioner is either a Thread device in an existing Thread network, or a device external to the Thread network (such as a mobile phone) that performs the Commissioner role. The Joiner is the device wishing to join the Thread network. A Thread Commissioner is used to authenticate a device onto the network. It does not transfer or have possession of Thread network credentials such as the master key. This guide covers basic, on-mesh commissioning without an external Commissioner or Border Router. To learn how to use an external Commissioner, see External Thread Commissioning. For an example of commissioning using virtual devices, see the OpenThread Simulation Codelab. Flash each binary to the desired device. One device serves as the Commissioner, the other as the Joiner. Specific instructions on building and flashing supported platforms can be found in each example's platform folder. Use the * wildcard to allow any Joiner with the specified Joiner Credential to commission onto the network. The Joiner Credential is used (along with the Extended PAN ID and Network Name) to generate the Pre-Shared Key for the Device (PSKd). The PSKd is then used to authenticate a device during Thread Commissioning. The Joiner Credential should be unique to each device. Note: The Joiner Credential is a device-specific string of all uppercase alphanumeric characters (0-9 and A-Y, excluding I, O, Q and Z for readability), with a length between 6 and 32 characters. To restrict commissioning to a specific Joiner device, use the eui64 parameter, which is the device's factory-assigned IEEE EUI-64. The Joiner device has successfully authenticated itself with the Commissioner and received Thread Network credentials.